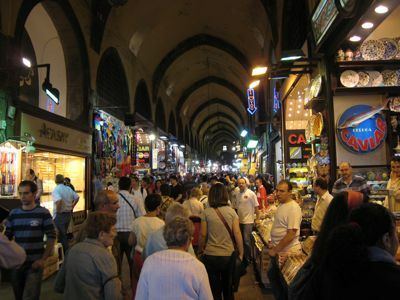 At one of the frequently recommended stalls (#18) for purchasing Turkish delight, I spied several tins of caviar in their refrigerator and casually asked how much the Beluga caviar was per 100 grams. The first price quoted was somewhere above $350 ($3,500 a kilo) and I feigned shock, and selected a few more sweets instead. But the salesman, Ibrahim, spotted a Marketman in a flash, and quickly pulled out two tins, hiding the covers, and handed me a small plastic spoon so that I could taste the contents of each tin. One tin had large roe, lighter in color and with a lower salt content, definitely “malossol”. It was stunningly good. A second tin had nearly as good caviar but slightly saltier and not as creamy. I had no idea what these were, but stated with confidence that the first tin was brilliant, and he would spoil all of the rest of the caviars by letting me taste that first… he grinned and said, “that is our finest Iranian Beluga caviar”, the second tin was Sevruga. I had obviously passed the first challenge. Then I went on to taste the Ossetra, some Royal, some pasteurized jet ink black fish roe, and a total of 6 different caviars. I figured I had already tasted some 10 grams of the delicacy, and could walk away feeling pretty good, if not a little djahe or embarrased about not buying anything… But that first taste was enough to get me hooked. I bargained a bit, discussed packaging for transport for a larger volume, and finally agreed to purchase a small tin with 50 grams of the Beluga caviar to “taste back at the hotel,” and if satisfied, I would return to purchase more for the trip home. I ended up paying some US$90 for the 50 grams, or roughly US$1,800 per kilo equivalent, knowing this was the my key food “goody” for the trip. I rushed home clutching my tiny plastic bag, hoping I hadn’t been royally screwed. Mrs. MM was to be the additional taster, as she is a huge caviar fan, I figured she would temper any enthusiasm I had if it was not warranted. I only had enough money in my pocket to take the tram back to the hotel! 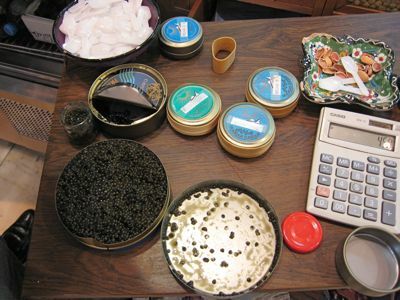 Oh, I forgot to mention that I insisted on taking my 50 grams from the tin of Beluga caviar that I had actually tasted. I didn’t want any risk of buying a sealed tin, only to find out later that it wasn’t of the same quality. Ibrahim, the caviar dude, gracefully scooped out some 55-60 grams (an extra 20%, yahoo!) of the stuff and packaged it in a fresh tin for me. 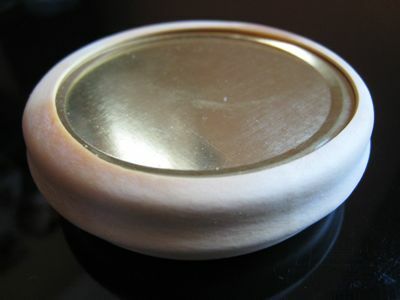 The golden tin, just 3 inches across and perhaps 3/4ths of an inch high, was then surrounded by a thick taut rubber band, then into some foil for insulation and into a vacuum packed plastic bag. He would have given me some ice or an ice pack as well but I told him I would be eating it within the hour, so it wasn’t necessary… You must keep fresh caviar chilled, and NEVER freeze it. So out the door Mrs. MM went, in search of some bread and sweet butter. Back in 10 minutes, we enjoyed the rest of our tin of Beluga caviar with bread and a little butter and it was fantastic. The only thing missing was some champagne or ice cold vodka. Eating out on the tiny balcony of our hotel room, facing the gardens of Topkapi palace, it seemed a fitting tribute to the opulence of a bygone era. This is not something we are going to do very often, but it is memorable when it happens. As for The Kid, she was a bit worried that she wouldn’t like the caviar, but after a tentative taste, she went on to have SEVERAL servings of the stuff… egads, starting right at the pinnacle of caviars, will she ever settle for less? So I am sure the ultimate question many of you are asking yourselves is, “was it really worth it?” At US$90 for some twenty small servings, enjoyed by three, I thought it was a very reasonable splurge. Others might opt to buy several doodads instead, or a mediocre meal at a mediocre restaurant, and to each their own, but Marketman & Family enjoyed this little tin of fresh Iranian Beluga Caviar… And had we indulged in this manner at a Parisian or New York based specialty restaurant, assuming you could even get the Beluga caviar, this would have cost upwards of US$500+! Marketman, I’m glad you found what you were looking for! 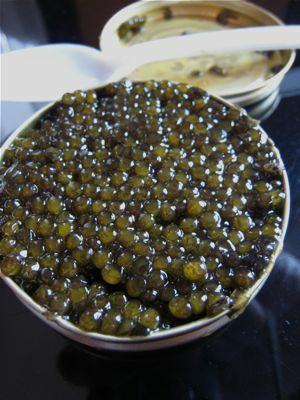 :-) I’ve only had really exceptional caviar once on a trip, and the taste is unforgettable! MM…You wet my appetite!!!!!! I wanted to eat your last picture of bread, butter, & caviar in hand!!! I had my first Beluga caviar at Zaybar Deli in New York and that was in 1987. I loved it. Then I had my second and succeeding Beluga in Las Vegas, but I don’t buy no more than $100 worth. One time I mixed the Beluga with japanese rice, chopped smoked turkey, and white truffle oil. Then I wrapped those with grilled seaweeds. First I brushed the seaweeds with sesame sead oil and some sea salt then grilled in a turbo. That was how I extended my Beluga. If I may be excused for redundancy, the last picture is the ultimate and youâ€™re final statement is so true. The now defunct Caviarteria was my sweetest revenge, my best way ever of getting back at my bosses. hi MM i’m green with envy! I first time I tried caviar was in St. Petersburg,Russia but I was not impressed. Probably it was not the best. I should try it again, probably this time to look for color, quality and ask some questions. Thanks for the info. Sorry, MM, no caviar for me. But I do appreciate the fact that you indulged with your family and for that, it was well worth it!! Hi MM, Just wondering, what kind of camera do you use? You have great pics…The caviar post reminds me of a dinner at a russian restaurant in Helsinki. The food was excellent but it took ages. 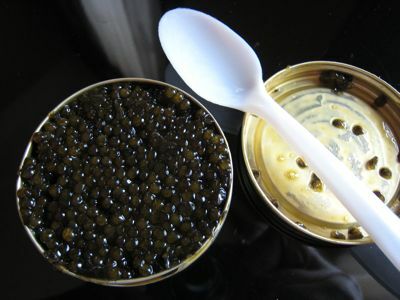 $90 for 20 servings of excellent caviar, shared with your family. Seems like a good price to me. the last picture is beautiful. so, did you go back to purchase more to bring home? you should have gotten insurance for it as well:-)..nice to hear you enjoyed the caviar..$90 can be earned or saved again, compared to having passed up the opportunity and saying “sayang” later on..life and food are meant to be savored with gusto..once again, reason for the latest poll revealed.. I just checked the website of Caviar Russe in NYC. Caspian Sea beluga is currently unavailable for purchase, but they charge $11,925 per kilo of Black Sea beluga!!! i am not really a caviar fan. when i was a licensed tour guide, a russian guest gifted me with two tiny tins of caviar. my friends enjoyed it but not me. MM, I think you just know how to make the best of everything where ever you are. I have a question and need help from you or possibly your many fans living in Manila. I have a friend who adores filipino food and is on his way to the Philippines. I would like to offer some advice to him on “street food” which I know he would just want to eat everything in sight without much thought of the “pains” he could later experience if he’s not careful. What street foods should he definitely stay away from and which ones are basically safe. Street food safety: Anything that has not been touched by human hands AFTER cooking is probaby safe: suman, bibingka, fried banana Q, unshelled peanuts, etc. Unpeeled fruit, canned or bottled drinks are okay as well, avoid meat or seafood, or noodle dishes offered on possibly unsanitary dishes or flatware. Based on the color alone, one could tell it’s really good Beluga Caviar (it should be dark gold/champagne in color). For that price, absolutely worth it! Oh my, that looks good! A few months ago, I was traipsing down a street on the way to a meeting and chanced upon the Petrossian boutique in Paris, which turned out to be on the same street. My pocket was woefully not full enough to buy even just a smidgen of caviar but I would have loved a first taste! And I agree – I think that is a better buy than, say, the latest cell phone or electronic gadget out there. Wow sarap! Na-inggit naman ako sa post mo! I have never tried Beluga caviar before.. the ones I have tried are sevruga and ossetra and I doubt if they were malossol :-) On my most recent trip to SFO, my friend and I splurged and had Sunday brunch at Ritz-Carlton. They had caviar and yes… ibabuso ko! He he! And at $78/pax (excluding champagne), dapat lang! :-) Unlike you though I like it with the traditional add-ons… and on blinis please! I haven’t tasted a caviar altough I have seen this served in hotels in Manila. I actually don’t know how to eat them (poor me!) With this post, I think I should include caviar on my list of things to try before I die. 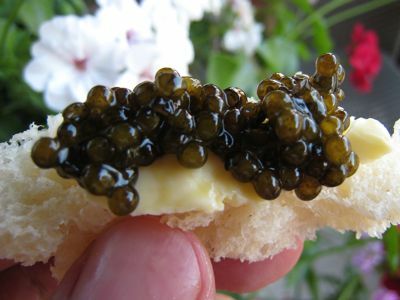 Question.. is there any other way to enjoy caviar aside from eating it with bread and butter? Is it better by eating it just plain caviar with a bottle of champagne or vodka as you would like to have it? Had a comanding officer who used to work with NATO in Brussels. He told me that his job is to wine and dine Russian Generals. 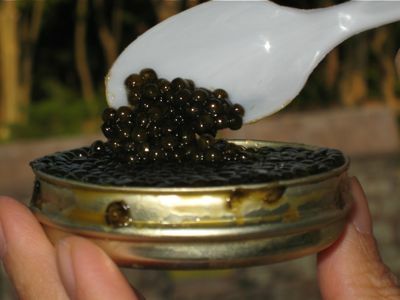 He was able to access Beluga Caviar from Russia and he told me that it was sinfully cheap there in the Motherland. OMG!!! Beluga caviar! Yes I would have the same for US90or even more anytime! With that reassurance of quality of course. Forget everything else. I was one of those who answered beluga caviar in your polls. I wish my last meal will be mallosol (lightly salted) fresh, beluga. It doesn’t get any better. Had fabulous beluga in Moscow, from Azerbajian, and brought back a kilo. Won’t happen again I suppose, but one can dream. I really enjoy Caviar, and agree that it is best eaten with slightly toasted bread or blinis only. and of course a little butter never hurts. But for me although Beluga is the absolute best, for the money I would rather have sevruga or even malosol so I can have more! MM Because of your Post The Mrs. and I just Opened a 112GM Can of Paddlefish Caviar I brought home from Zabar’s its only $50 for the can. its not bad at all…. I think I mentioned here elsewhere a cousin finding himself part of a delegation to Moscow once where their hosts oohed and aahed at the load of lakatan they brought while they themselves tried their mightiest to strike just the right balance between gushy appreciation and impeccable diplomacy in scarfing down the quantity of caviar they were feted with. Btw, while weâ€™re in cloud nine, did you also pick up an ounce or two of Iranian saffron? Apicio, yup, you got it… definitely had to get the saffron, the finest i have smelled or seen. My apologies everyone, I am traveling on business, hence the slow response to all of your comments… will catch up later today hopefully…. MM …. 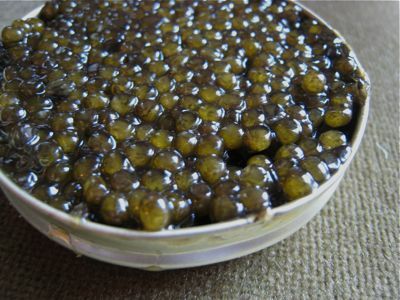 where can you buy iranian/russian beluga 000 caviar in manila? i know santis has some but not sure how long they have had it. thanks MM… i checked this afternoon and they have sevruga and imperial osetra… any idea on where to get beluga? MM, as I was reading this I felt like I was tasting the caviar myself! aliw! MM… there are a few pleasures in life that are worth paying for. :-) I was hoping that you would have the insider scoop on where to get beluga. I guess i would have to wait until i go to hong kong and get some. Why not try asking the owners of the local Iranian restaurants, like Arya in Promenade Greenhills) or Hossein’s in Makati? They might be able to source some for you, if they frequently import ingredients from Iran (Note: I’ve never asked them though, it was just an idea that popped into my head). ON ONE OF THE CRUISES WE WENT TO, DIFFERENT KINDS OF CAVIAR WERE DISPLAYED AND SERVED ALONG WITH THE SUMPTUOUS BUFFET. IT LOOKED GOOD BUT I WAS NOT TOO CRAZY ABOUT IT…. Growing up In Iran, I remember that my father used to buy fresh Iranian caviar in 250 gr cans right from the fishermen at caspiann sea shores. At the time of islamic revolution of 1979 and after that, the clergy regime announced that the strogen fish and caviar was Haram ( forbidden by religion).. and so you could buy caviar ( and lots of it ) cheap at the black market. We bought it for 5-10 US dollars for a kilogram !! I had caviar for breakfast almost everyday for more than a year ..
Iran has a lot of things to offer – food, pastry, nature, you name it, they have and Caviar is one of their priced item. I have seen them being sold at Iranian Airport (both in their International and Domestic) but since I’m not a “Fish Person”, I was not interested at all. Caviar isn’t really my thing…I only saw it once when my father in law bought a whole bunch from Shiraz, Iran. When I inquired about the price, he said he paid for $150/100g. I couldn’t believe my ears so I have to double check it with my husband who told me it is right. I guess the prices in Turkey are not that bad but if you really want to get the best, you should go to Iran. p.s. for INKED_CHEF: I read that you were told to inquire at ARYA and HOSEEIN. I’m not sure about HOSEEIN but in ARYA maybe you will have good chances. The owner of the restaurant is a Shirazi Iranian married to a Filipino(and so am I – his mother-inlaw and I were on the same flight going back to Shiraz from Phils last year). If you meet him or the lady owner, maybe you could ask them and I’m sure they will gladly help you. Goodluck!